Next time your printer stops printing for no reason or changing the battery of your MP3 Player from Authorised Service Station costs a major percentage of the original cost, Be informed this all is a part of an industrial design policy,Planned Obsolescence, to make goods last a bit shorter by tweaking the design. Never mind a broken device is an opportunity to learn. That’s what i had in mind when i didnt throw away my 2004 ATX supply when it failed in 2010 probably due to some connection/connector issue. In a haste to get the PC working in summer break I installed a new supply on the PC and kept it with me to play with later. After saving it from the routine disposal drives of Diwali , I finally had some use of it when the WalWart 12V@1A supply i have was not capable of driving the stepper motors i used in my major project. 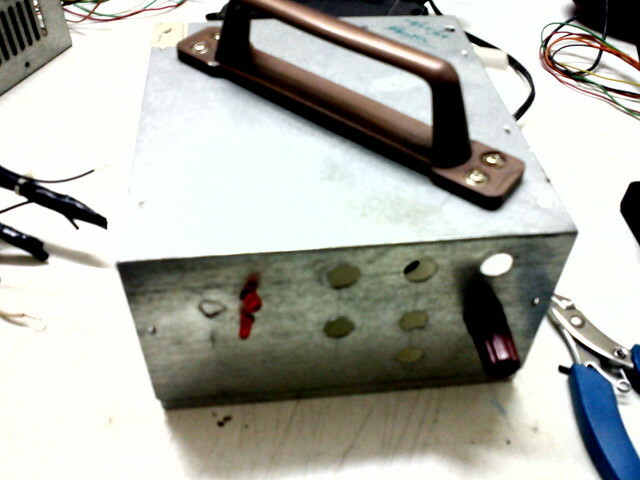 Moding ATX to use it as a bench supply is not new.The power output is pretty stable and can provide high currents. DP has an amazing ATX to Power supply Board too. I wanted one that i could carry around anywhere and should be in one piece and durable with no wires outside the case except the power cable of course . Lets see how that ATX Connector looks like. Shorting PS_ON(14) to GND will turn on the PSU and that is what actually the motherboard does. 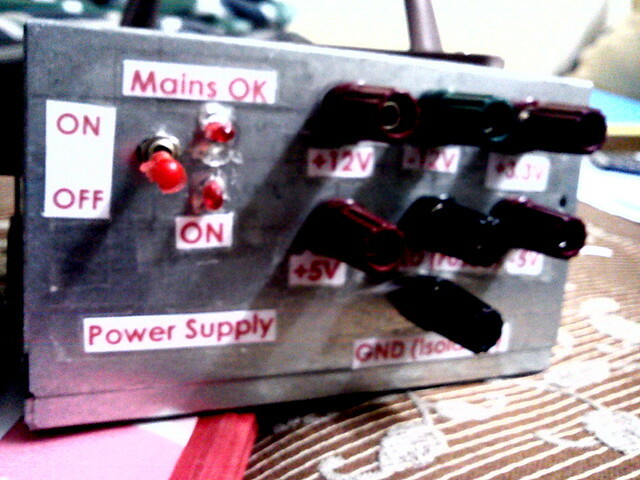 By checking the voltage on Power_ok or Power Good(8) one can decide whether the power supply OUTPUT is ON (+5V when ON). By checking the voltage on +5vSB(9) one can decide whether the Mains are ON or not (+5v when ON). So, I will connect LEDs to pin 8 and 9 and a switch between 14 and GND, thats pretty much it. 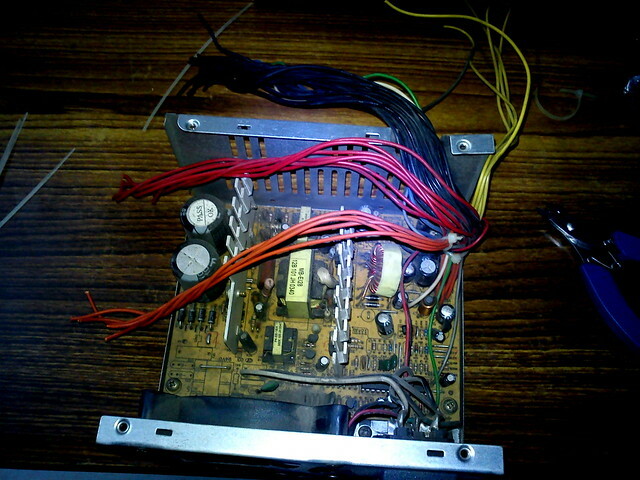 Since I had the no wires outside clause and usual power supplies have more that one connector, I had to open the power supply and cut wires literally like a barber and then solder the same coloured ones together to bring them onto the front panel. I then drilled the holes @ CEDT for the Thumb Screw connectors i got from Lajpat Rai and also fixed a small handle to it for carrying it around. 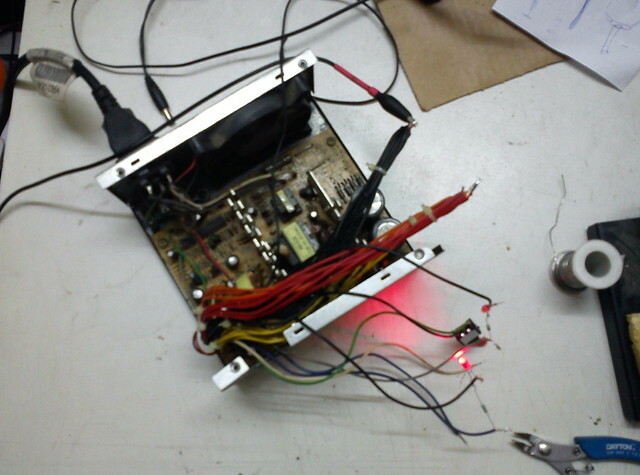 Then connected the circuit as mentioned above to test it. Carefully packed everything inside the original case. 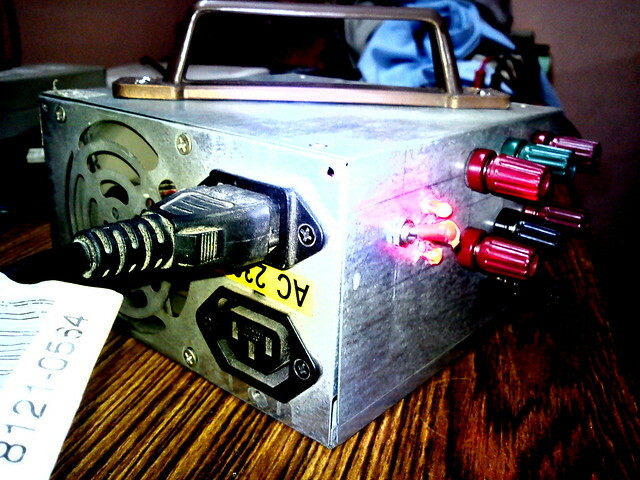 Printed some labels from my archaic inkjet and I had my ATX power Supply ready ! Pretty simple and effective hack ! So, when are you making one ?